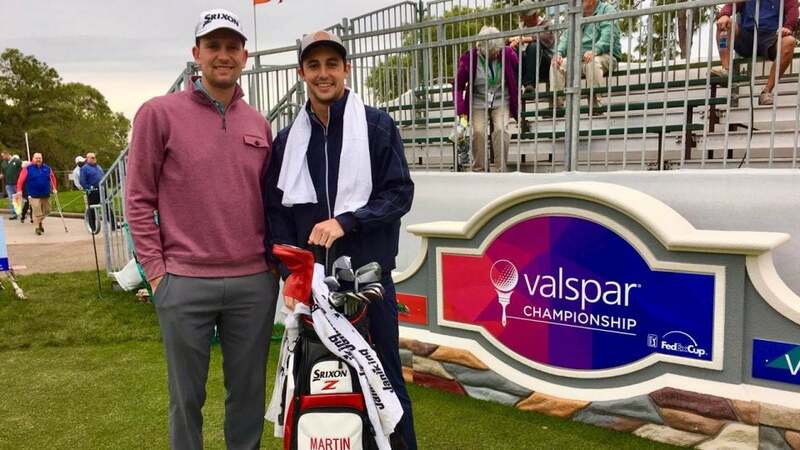 Martin Trainer has a new caddie on the bag this week, GOLF.com's Dylan Dethier. PALM HARBOR, FLA. — Martin Trainer is on the other end of the phone, and he’s struggling to get the words out. “I mean, dude — I was playing mini tours a year ago!” Implied in that statement is where he is now, at the wheel of his courtesy Lexus sedan, which was waiting when his NetJets flight from Jacksonville touched down in Tampa minutes earlier. Next stop: the PGA Tour’s Valspar Championship. It’s been a heck of a year for the 27-year-old. Of all the unlikely recent PGA Tour success stories, Trainer’s road to the top may top them all. In March 2018, he flew to Mexico to play a Monday qualifier on the Web.com tour, even though he didn’t have any status. Trainer ended up in a three-for-one playoff for the final spot in the field and squeaked through. Then he won the entire tournament. He still can’t believe it. He already had his flights booked to play the PGA Tour Latinoamerica that spring; suddenly he had Web.com tour status secured for two years. His newfound cred didn’t translate to immediate success — not by any stretch: T61-MC-MC-MC-MC-MC-T81-MC-MC-T53-MC-T9-MC-MC. But then … he won again. The pair of W’s meant that by the end of the year, he went straight to the big Tour. He has only one top 25 since his debut last fall: another win, three weeks ago at the Puerto Rico Open. Thus far, Trainer has been golf’s Ricky Bobby: first or far from it. The reason Trainer is calling me is because I’ve been enlisted as his looper this week. Yep, for the next few days I’m pulling double duty: PGA Tour caddie by day, GOLF.com writer by night, with the aim of giving you an inside look at the looping life. Trainer and I were originally supposed to arrive by vehicle together Monday afternoon, using the 3.5-hour drive from Jacksonville for some team bonding. But a can’t-miss opportunity popped up: He was invited to a pro-am at TPC Sawgrass on Monday followed by a comped chartered flight to Tampa. Enjoy your Camry, Dethier! Trainer hasn’t let fame — or those big paychecks — go to his head. We’re splitting a room at a Holiday Inn, and he’s a major proponent of the Whole Foods hot bar. 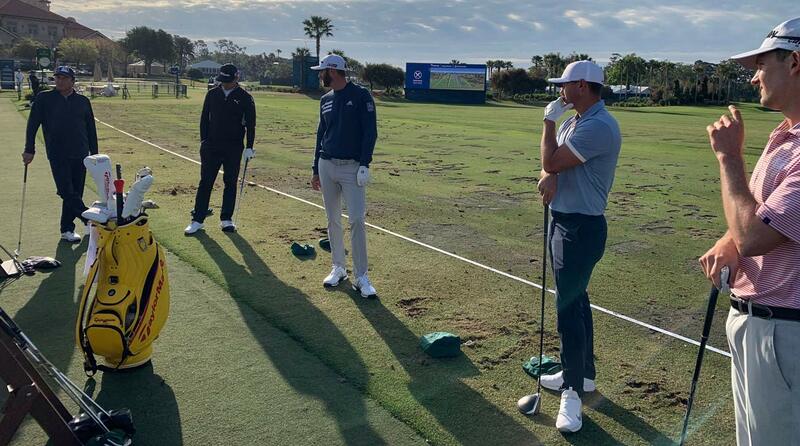 He’s still in awe of the pre-round scene he witnessed Tuesday morning at the Sawgrass practice range, where a number of A-list pros had gathered to conduct clinics. When he arrived on the range for a “long game” session, he found this glittery group waiting for him: Dustin Johnson, Brooks Koepka, Justin Rose, Justin Thomas, Gary Woodland. His approach? Blend in with the crowd. “They definitely thought I was just some guy who had shown up,” he said of the assembled fans — and maybe some of the players, too. For a Tour winner, Trainer doesn’t think a whole lot of his own stature. Martin Trainer, far right, on the range at TPC Sawgrass with some Tour A-listers. After the pro-am, he hopped a shuttle to the airport with a group that included Thomas, Woodland, Nick Taylor, Scott Langley and Hunter Mahan. Thomas headed to a flight of his own; he was headed back home. The others were off to Tampa. When the jet landed, a fleet of courtesy Lexuses awaited. Martin was assigned No. 7, a pale-gold sedan. Not all players would pick up their caddies, but I’d just dropped my rental at the nearby airport garage; Trainer swung by Whole Foods and then rolled through to pick me up. His habits may be a holdover from his mini-tour days. His budget, too. So here we were, posting up at the Holiday Inn, even though the guy just cashed a check for more than half a million dollars. I get it, though. If you’re spending $2,000 on rooms for the week (the going rate for most nice-ish hotels this week), it’s that much harder to turn a profit. On Tour, there are no guarantees. My day went slightly differently. After some morning wrap-up work from Jacksonville, I returned my rental car and rented another one (my friends at Alamo could find no way around this) and shipped off through the paradise that is central Florida. I saw a whole bunch of interesting billboards. I passed up several chances to buy fireworks in large quantity. I drove through Ocala, one of four cities in the U.S. dubbed “horse capital of the world.” The lawns were greener there. I stopped at Zaxby’s to pick up some fried chicken, which exceeded expectations. As I drove, I considered the perils of raking a bunker poorly, or slowly. Or getting dragged into a rules controversy. I’ve driven across central Florida a number of times in the last few years; the mind tends to wander. 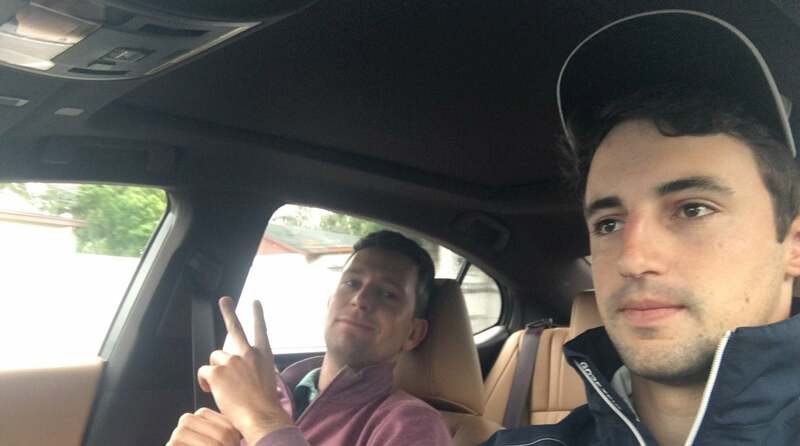 Trainer, left, with his rookie caddie at the wheel. How did any of this happen? The basic chain of events is as follows: At the Mayakoba Golf Classic in the fall, I was walking around the practice green when a caddie shouted my name — Matt Garcia, a guy I had played mini tour golf with. He was caddying for Martin Trainer, a fellow Bay Area player and longtime friend. We got tacos. I saw them again at the Honda, and then at Bay Hill, and then at the Players. Matt was planning to head home, but Martin figured he may as well keep rolling. I mentioned, half joking, that I’d walked the course with Tiger last year and was extremely available. And when you think about it, even in these guys’ golf-heavy orbits there are only so many qualified, familiar, available caddies who can swoop in for a week’s work. I was in. Oh, and we’ve already settled on a percent cut of the winnings, a must in the El Tucan era – five percent. I’m not a pro caddie, after all, and Trainer said were he to cash a big check, he’d want to send some the way of his day-in, day-out looper. I like that. What’s ahead? Martin was initially going to take Monday off, but ended up playing the pro-am, so Tuesday will be light — registration, a workout, some practice and something away from the course to keep his mind fresh. This is a decision that he made that I am supporting and co-opting, which I expect to be the theme for the week. He’s an alternate for Wednesday’s pro-am. Innisbrook awaits — and a different view, for me anyway, from inside the ropes.